Happy Birthday Betty Page.... She was the theme this month. You should of gotten here from Alaine’s Blog. If not please go here to start from the beginning. You don’t want to miss any of these great projects. It was fun making this card. I used a quote from her blog. She had said “I was never the girl next door” I loved this saying. She is inside the card with the digi paper I got from Kristi Dailey. I made the window with a die I got from Our Daily Bread Design. I wanted her to be in a building so she would be the girl next door but with an attitude. Just think what the neighbor boys would do with her living next door. I hope you enjoyed your visit, now head on over to Stempelientje , to see her awesome project. Your peek-a-boo design adds a little touch of mystery...and naughtiness! I feel like I'm peeping in on her through a window! 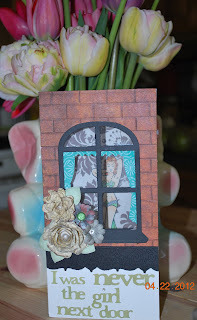 Love the window idea, cute card! That is so cool peeking through the window to see Battie! I LOVE it,a true 'Bettie' card! Interesting use of a die cut/window card here. Perfect quote, and what a cool concept for this card! I love how you really took the quote and ran with the idea. Great idea!!! Oooh. I love the "Peeping Tom" aspect of this card. Really great concept, really well done! The window on the card is fabulous. I love the way Betty is peeking out from the inside and right there when you open the card. So inspiring. I LOVE what you did with the window peek. Great card! Love the window!!! Love the window. The saying was great, and the peekabo was wonderful. Thank you for all the great comments, it was fun to make. Great card! I love the window. Awesome job!